This 1-Micron Canister-Filter Upgrade Kit includes everything you need to upgrade your G0710 or G0710P wall-mount dust collector for 1-micron filtration. Effective dust collection not only keeps your shop cleaner and more pleasant to work in, but it can also improve the air quality in your shop. 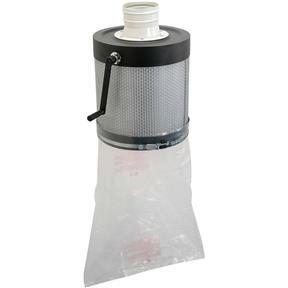 The included canister filter provides six times the surface area of a bag filter! This filter replaced the bag on my old Delta dust collector. I don't see any of the fine dust I had with the bag. Easy to install.and perfect fit. Looks great too. It's quiet. Bought this to upgrade my 1HP grizzly floor mounted dust collector. Very easy to assemble. Didn't come with a gasket as was described in the packaging. Not sure if that was left out or the 3cm thick padded tap is suppose to replace this. Probably would give it a snugger fit. THis cannister is working great for the project I use it with. Keeps the air super clean and we'll built.I love the filter cleaner.Well worth it.